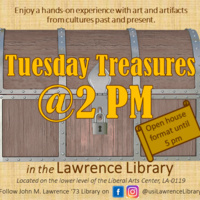 Tuesday Treasures @ 2 p.m. Enjoy a hands-on experience with art and artifacts from cultures past and present in USI's Lawrence Library. This open-house styled event runs from 2 to 5 p.m. on Tuesdays during the Spring semester when classes are in session. CLASSES WELCOME.